If you LOVE to cook and bake then these heart shaped measuring spoons were created just for you! You can measure the right amount of love into every dish with this four piece heart shaped measuring spoons set! These sweet and functional heart shaped measuring spoons feature ” A Pinch of Patience” = 1/4 teaspoon, ” A Dash of Kindness” = 1/2 teaspoon, “A Spoonful of Laughter” = 1 teaspoon, and “A Heap of Love” = 1 tablespoon. This cute heart shaped measuring spoons set is available for $ 10.99 plus shipping from the Make Life Special Kitchen Shop. If you would like to order a set for yourself…or maybe a few sets for gifts, just fill out the CONTACT FORM on the Make Life Special Home page and give me your name, address and email address. I’ll let you know how much the shipping is for your area and send you a PayPal invoice. It’s that easy! 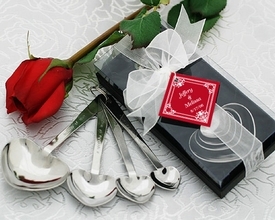 These heart shaped measuring spoons are crafted from stainless steel and come in a black velvet lined gift box. Put your love of cooking into everything you make when you use this cute set! To Order Just fill out the contact form on the homepage and send me your name, address and email address. I’ll get right back to you with the total cost including shipping. This measuring spoon set will give you all you need to cook with love! I know you will enjoy this heart shaped measuring spoon set as much as I do!